Magnaryder wrote: In my quest for better sound through correct system set-up I did some research on my phono cart and found it needs 400-500pf of loading. Anyone know how to accomplish this? Looking around the net I've noticed the BigDog(big$$$) phono pres have switchable capacitance and resistive loading. I've installed 3 deParavicini EI 7DJ8s on the main board and 4 on the phono board. I still have the stock 12AX7s on the phono board. How significant could a tube change here be? 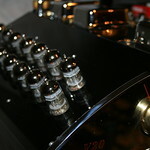 The 12AX7s on the phono PCB provide the majority of gain required. I inadvertently replaced mine with 5751s (thinking I was being real cagey) and the phono sounded horrible. I subsequently replaced the 5751s with Amperex 12AX7s and life was worth living again! Trying different 12AX7 tubes on the phono PCB can make a TREMENDOUS difference in the sound. Good to see you again stereo buff!!! What 5751's did you use? You know stuff can sound different system to system. I had some Bugle Boy (Amperex) 12AX7's and they didn't work well in my set up. The 12AX7s on the phono PCB provide the majority of gain required. I inadvertently replaced mine with 5751s (thinking I was being real cagey) and the phono sounded horrible. Eric 'MRHP' had differing experiences with the 5751s. He was digging them. I'll give them a try. I subsequently replaced the 5751s with Amperex 12AX7s and life was worth living again! Trying different 12AX7 tubes on the phono PCB can make a TREMENDOUS difference in the sound. Right now I've got the Lindal green dot blackplates in there surrounded by the deParavicini 7DJ8s on the phono and the main boards . Sounds great to me. It might be your cartridge's output is to low for the 5751 combination. The 5751 is a militarized (read reinforced internals) version of the 12AX7, to some extent. Other than the mechanicals, however, the gain of the 5751 (amplification factor of 70) is specified to be less than the 12AX7 (amplification factor of 100). I use a moving magnet cartridge with plenty of output, so that's not was my problem. Speaking with Bob, he said that the circuit needs every bit of the gain the 12AX7 provides. Interesting enough my Sunfire pre does not have a phono board so I use a Pro-Ject phono preamp and the 5751's really sound great in it. Maybe a difference in the two different phono boards??? MRHP wrote: Interesting enough my Sunfire pre does not have a phono board so I use a Pro-Ject phono preamp and the 5751's really sound great in it. Maybe a difference in the two different phono boards??? It might stereo buff's system as a whole. 5751's work well in my Sunfire phono section. Also it's a matter of sonic taste. System as a whole and sonic taste....probly the most key factors. MRHP wrote: System as a whole and sonic taste....probly the most key factors. So true Eric. We better watch ourselves, Chauss will be popping up in a minute, the Obi Wan of tubes! All I can speak to with authority is that after I put the 5751s in and it sounded horrible, I took it over to Bob's place and he swapped out the 5751s for 12AX7s, reciting the info about the former having insufficient gain, and my phono has worked great ever since. Who knows why 5751s work for you and not for me - I'm glad they work for you! FYI, my phono PCB was an NOS kit board that came without tubes; it did not come originally installed in my preamp from the factory. That's cool stereo buff, i 'm just saying everybody's system as a whole is different and swapping out different things might yield different results system to system. What make was the 5751's you tried? F1Nut claims system synergy accounts for alot and I must agree. I run alot of different speaker and amplifier designs/combinations, ribbons, horns and point source, ss, tube and hybrids different flavours so to speak. Dixieland on horn speaks, magical baby. I've been tidying up around the house a bit today and playing some tasty vinyl amd I gotta say I'm digging the Sunfire in front of my CF amp and my Fortes. This rig is pretty much everything I want it my rig at this point in time. Spatially, the soundfield envelopes me. It's broad, deep and the imaging is pretty darn good. I can place each instrument and voice in space. The 'air' between images is palpable. It's amazing what you can do in your living room with a little time and patience. I didn't initially realize you were not using the Sunfire phono board. That said, I think you've hit on the difference. Bob's phono circuit design requires the extra gain the 12AX7s provide over the 5751s to operate correctly. The Pro-Ject phono preamp circuit is different, and the 5751s provide sufficient gain for it to work satisfactorily. 5751s are great tubes; that's why I tried to use them in the first place! Eric, I didn't notice you were using an outboard phono pre either. It might explain the differences heard by other folks who have tried the 5751s and haven't had any luck. obMe: I really like my Lindal green dot blackplates. I have some blue dot RCA 12ax7s and some Mullard blue dot blackplate E83CCss. I'm going to roll the 'dot' tubes and give them all serious listening time to 'try' and discern any differences. The only problem I have had with 5751's was with the GE 5751 triple mica black plates when I played classical. The sound was compressed, they didn't generate the sense of space and scale of the performance. They were great with everything else with a slightly rolled off top end. A very musical tube. Also that's a 1950's vintage tube.